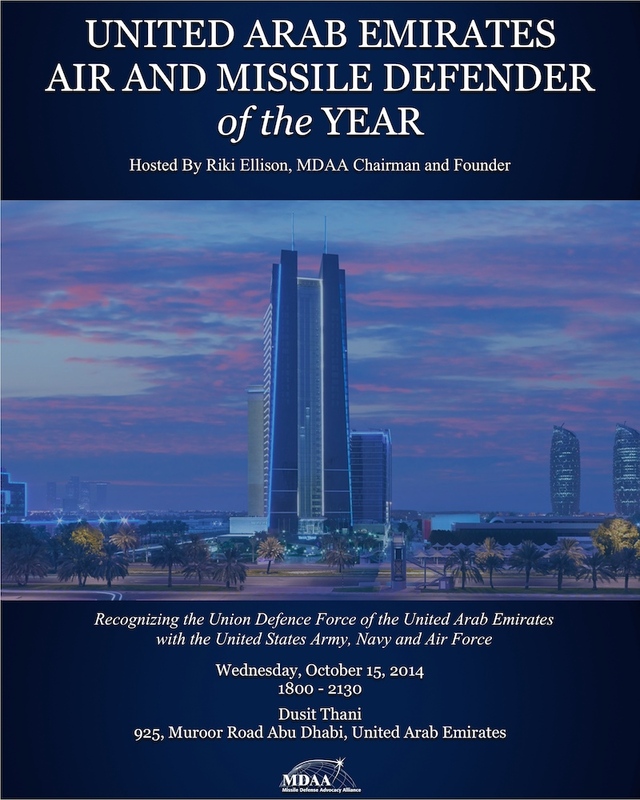 On October 15th, 2014 the MDAA had the honor to bring together our joint U.S. and Emirati air and missile defense forces in Abu Dhabi, UAE. The event recognized the excellence of the air and missile defenders protecting the United Arab Emirates, and the outstanding team effort between the two nations. This effort spans the reach of the UAE and U.S. military services on land, sea and air, right down to the leadership and the individual airmen, soliders and sailors who defend the United Arab Emirates. Brigadier General Majid al Nuaimi and Brigadier General Salim of the UAE military forces with their top 8 Missile Defenders were honored, along with COLDusty O’Neill’s 108th Brigade and LTC Pat Costello’s 3-4 ADA Battalion’s top eight missile defenders deployed in the UAE. Also included in the recognition was the U.S. Aegis BMD ship the USS Mahan (DDG 72) of the 5th Fleet with commander Zoah Scheneman and their best air and missile defense sailor presented by RADM Gary Rosholt and the United States Air Force Air Warning and Control (AWAC) pilots with Brig Gen John Quintas out of the Al Dhafra Air Force Base in Abu Dhabi. Air and missile defense is a vital component of international security that can deter threats, defend populations, and positively shape a region’s strategic stability. In the field of BMD, the UAE is a leader. This is demonstrated by their commitment of resources in equipment and manpower, as well as the knowledge and skills required to operate these complex systems learned here in Abu Dhabi and at Fort Sill, Oklahoma. We thank them for their leadership and their commitment to excellence on air and missile defense. Air and missile defense is a true team game, a dynamic team effort that spans across military services, civilians, nations and diversity of cultures to make up a collective unbeatable team. The strength of the team is in its diversity of cultures, people and thoughts that have earned trust by relationships with action and deeds both horizontally with whom they work with and vertically with those they report to or command. When trust and relationships are the foundation and prevail throughout a team, they become unbeatable no matter what odds are against them or the circumstances they face. 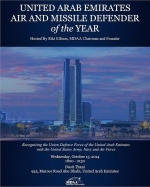 Our UAE Air and Missile Defender of the Year event represents the results of hard work and commitment by the United States and United Arab Emirates civilian and senior military leadership represented by these award winners over the past six years and highlighted by the joint successful live fire air and missile defense exercises two weeks ago. More specifically, our military leaders have forged solid relationships at the tactical level during many of the deployments and force rotations of the U.S. soldiers, sailors, and airmen. Exercises and joint sessions at the Center for Integrated Air and Missile Defense foster relationships that have had strategic impact. They build camaraderie, foster integration and cooperation, and most importantly, create the trust that is imperative on today’s battlefield as we confront a common threat. One of the imperatives of the U.S. National Security Strategy is to build partnership capacity. Nowhere is this imperative more evident and practiced than right here in the United Arab Emirates. From the first UAE Soldiers who graduated from the Air Defense School at Fort Sill, Oklahoma in March of 2012, to the successful live-fire two weeks ago, we see this imperative in action. Credit must be given to our industry leaders in air and missile defense as they provide the capacity upon which we operate. Since the first graduation in 2012 at Fort Sill by the UAE Airmen, the partnerships that have developed between U.S. and UAE forces have never been stronger. We have the ideal model for building partnership capacity between these two nations and we are much stronger with this partnership with air and missile defense capacity then we could ever be alone. This is MDAA’s first recognition event in the Arabian Gulf region. Through these technically complex systems, it is the soldier, airman and sailor that remain the most vital part to make these systems do what they do best: deter conflict and provide peace. As two different nations and cultures, we owe great gratitude, appreciation towards these heroes.